QA Data is a South African, full service clinical research data management company. QA Data’s services are in accordance with the highest quality standards including ICH Guidelines and FDA Regulations, for registration purposes in the US and many European countries. 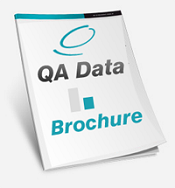 To learn more about the full range of services offered by QA Data please download their latest brochure.